So, the Atari 8-bit Software Preservation project has done some amazing work over the last few years using Kryoflux and SCP devices to make magnetic-level disk images of copy-protected floppy disks, creating disk image files in ATX format and distributing them via a periodic torrent seed. The current seed is over 700 megabytes and something like 1,500 individual titles. 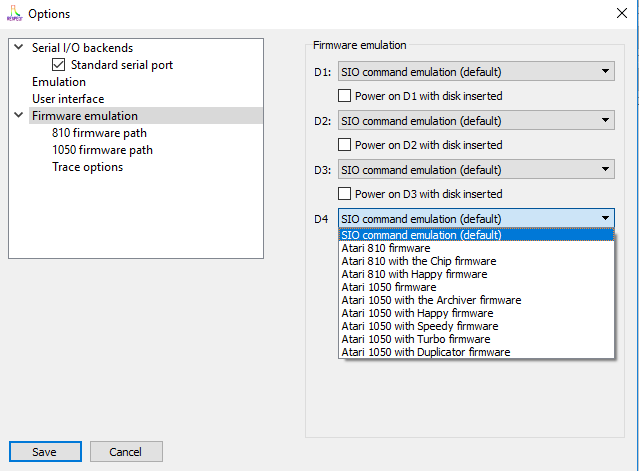 Besides use in current versions of Altirra, there are a few options to use these files on real hardware - if one has something like an SCP device and a proper 5-1/4" disk drive, the ATX files can be written back to magnetic media and run like an original. I understand as well that use of AtariMax APE software with the VAPI.DLL file plugin will allow use of most/all of these ATX files on real disks, but of course APE requires use of a Windows machine or something like WINE or CrossOver. Such a solution is probably beyond using APE on low-budget hardware like a Raspberry Pi. Apparently there is also some new-ish hardware in work coming out of Europe called the SDrive-MAX that has firmware that allows use of these file from an SD card device plugged into the SIO port. However, most of us using RespeQt obviously have and prefer using something on a separate box for our disk image loading/saving and general file manipulation purposes. To that end, one of the main participants in the 8-bit Preservation movement, ijor, has offered to assist people working on RespeQt to understand the file format and help add ATX file support to RespeQt. If I had basically ANY real understanding of C and Qt, I'd be all over this as my summer project. Alas, I have never used C of any kind, so trying to add support for an entirely new file format is well beyond me. So I'm throwing out to wider Atari world. If anyone can help, please contact ijor! Please and thank you. But the project seems futile, if the RespeQt maintainer is not available to integrate all the different work in progress to the main repo. Anyone can create pull requests. I think JoeyZ isn’t so much missing as just incredibly busy with school and life. And if he doesn’t respond to pull requests, the project can always be forked again if necessary. Peter, I know all that. But the question is: Who is the authority in the meantime? catch him on IRC and ask him if need be..
Well, that's the glory of open-source. No one needs authority, as such. Anyone can fork, make changes, create test builds (like your prior printer test build) and create pull requests. If Joey doesn't get back to you in some reasonable time, just rename the project, create a new Master branch and a release build for people to play around with and see how it works. I PM'd him this evening here on the forum. He hasn't been online here since February but hopefully he'll get a forum email or something letting him know. I did that and PMed him here. I didn't answer. Well, you are dodging the answer. Somebody has to do the "official" or we keep splintering the product and floating around packages, which have some feature, but not all. I mean, I can just put out some packages with printer support, but without ATX support. I'm not thinking that particularly glorious. Edited by JoSch, Sun Jul 1, 2018 8:16 AM. Actually, not at all. That's what open-source and permissive licensing is all about. This isn't Linux with some committee of old Unix graybeards lecturing the kids on how to code, and Linus sitting on high making pronouncements because he's the boss … There is no boss at all, just a project maintainer. And when the project maintainer goes MIA due to illness, death or just getting too busy and losing interest, you fork it, take over and run with it. Create a new branch, name it whatever you want and voila. You're now "officially" the maintainer of whatever you want to call your new project. If enough people like it and use it and give feedback, we'll get a Moderator here on AtariAge to archive this section or unpin it or whatever and the New Better-Than-RespeQt project will be pinned in its place. The reality is Joey Z. is MIA - I PM'd him last week and got no response. I guess I could try to leave a project note on GitHub or something and see if that gets his attention but it probably won't. His last activity on GitHub was 13 months ago when he made the last commits to RespeQt. Maybe he'll transfer the project to a new maintainer but if not, you use the open-source nature of the project and do what you need to do. Edited by DrVenkman, Sun Jul 1, 2018 8:42 AM. Edited by _The Doctor__, Sun Jul 1, 2018 2:34 PM. It was a couple months ago, multiple times. So no summer break. Edited by JoSch, Mon Jul 2, 2018 1:31 AM. My question was, who we want to be the maintainer for the time being. I don't want to fork another clone. That only leads to fragmentation. But, since nobody wants to answer that, we will want until such time. "Besides use in current versions of Altirra, there are a few options to use these files on real hardware - if one has something like an SCP device and a proper 5-1/4" disk drive, the ATX files can be written back to magnetic media and run like an original. I understand as well that use of AtariMax APE software with the VAPI.DLL file plugin will allow use of most/all of these ATX files on real disks, but of course APE requires use of a Windows machine or something like WINE or CrossOver. Such a solution is probably beyond using APE on low-budget hardware like a Raspberry Pi. Apparently there is also some new-ish hardware in work coming out of Europe called the SDrive-MAX that has firmware that allows use of these file from an SD card device plugged into the SIO port." Is that true -- that you can WRITE out an ATX to a real disk from APE using the VAPI dll? I was thinking that you could load and use the ATX, but there was no method to actually write it out? Last I remember there was no way to write it out using Atari hardware. The only way that I recall is the writing the magnetic flux image to a disk with a PC drive. That was always the Holy Grail -- to use a Happy or Super Archiver to write out the ATX. But maybe I've missed something here (or misunderstood what you wrote)? There was definitely a misunderstanding. No, there were two separate thoughts in my original post. As I wrote, you can use an SCP and a compatible drive/software to write the flux image files back to media for use on real disks. Alternately, you can load the ATX files to real hardware via APE + VAPI.dll, but that requires a Windows machine and a paid version of APE. Anyway, I haven't heard back from Joey Z., and none of the coders who've forked and/or contributed to the RespeQt project have volunteered to take over. That's disappointing but not too surprising, I guess. It's the downside to open-source in a very niche hobby. (As an aside, I plan to build an SDrive-MAX Arduino-based device in the next week or two to allow loading ATX files on real hardware - I've got an Elegoo touchscreen display and another clone Arduino UNO board coming this weekend. I just wish there was interest in adding ATX support to RespeQt - file manipulation and folder navigation is bound to be easier with a real screen and mouse than on a tiny touch screen). Edited by DrVenkman, Sat Jul 7, 2018 7:26 AM. At any rate, I've gotten an SDrive-MAX Arduino-based device mostly assembled and the firmware flashed, I've stripped apart the conductors on a spare SIO cable I've got that had a broken connector on one end, and once I get in some diodes (tomorrow) to isolate the Atari's DATA-IN line, I'll solder up the connections and give it a run. Edited by DrVenkman, Mon Jul 9, 2018 6:56 PM. I just read your post today. I do not read forum very often. I had the same idea one month ago and get the RespeQT v4 sources to add some enhancements. I wanted to get some results before sending back the code to the current maintener (or merge with a future r5). But, reading your post, I don't want someone else to start doing the same job. - emulation of the CHIP 810 at SIO level so that Archiver 1.0 or 3.03 can read/write disks with custom format (working with .PRO and .ATX). But there are still some bugs I have to track down for other operations. - accurate timing to make protected softwares based on timing work. The goal is to be able to use BitWriter software to write protected .ATX or .SCP images back to real disks (just a dream at this step - don't know if it is possible). Edited by ebiguy, Tue Jul 17, 2018 3:29 PM. Wow, that all sounds fantastic! Have you considered forking the project on GitHub so people can examine the code and/or help improve it? Or better yet, also submit your changes as a pull request to the main RespeQt repository? That could get Joey's attention to accept and merge the changes. I will try a pull request. But right now, I want to fix all things that do not work. Hi! any news regarding this topic? Still under (very active) development as I work on it every evening after work and the week-end. I will post more information in a few weeks when I have completed and tested some features. BUt don't worry, it will be released ! Edited by ebiguy, Sat Sep 8, 2018 1:48 AM. Good to hear you're still at it. I appreciate your hard work on this important feature. This is absolutely AMAZING work and something I have hoped for since getting back in to real A8 hardware--I have a bit of an enthusiasm for drives and disks so this is right up my street! I know I am only echoing any number of other chaps, but nonetheless please do accept my heartfelt thanks for all your work! I look forward to giving it a whirl when the programme is ready for public consumption. Would you mind linking to where that torrent for the ATX files can be found? Edited by morelenmir, Wed Sep 19, 2018 7:41 AM. What an enthsiam ! Thank you for your message. I will probably publish a release in 2 steps. A first one with only SIO emulation of ATX, Happy and Super Archiver. And a second one later with hardware emulation. This will let people test the first release while I am finishing the hardware emulation.